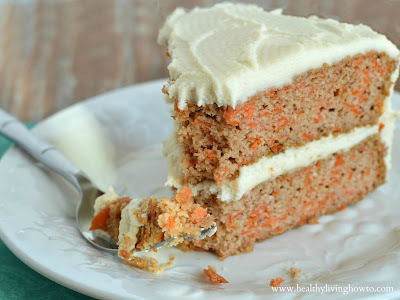 Carrot cake has always topped the list as my most favorite dessert. I created this healthy recipe for a birthday celebration and it was a hit! This healthy recipe is gluten free, dairy free and sugar free. Enjoy! Studies have shown carrots reduce the risk of lung cancer, breast cancer and colon cancer. Researchers have just discovered falcarinol and falcarindiol which they feel cause the anticancer properties. Falcarinol is produced by the root of the carrot to protect it from fungal diseases. Carrots are one of the only common sources of this compound.